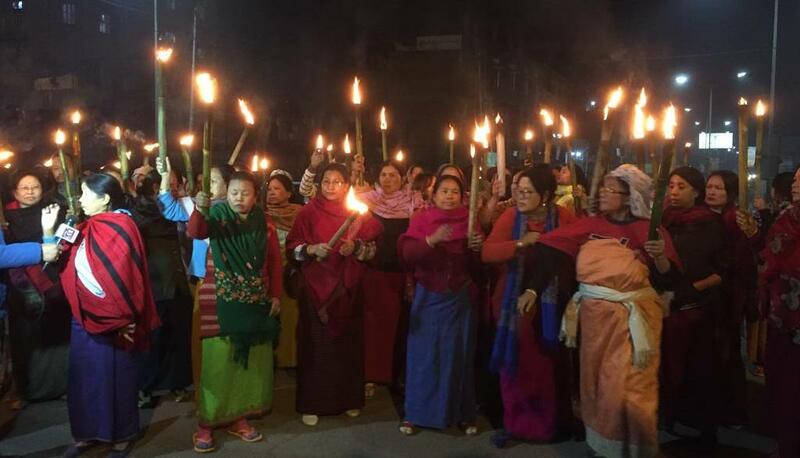 The protests against theCitizenship (Amendment) Bill have gains momentum in Manipur. People continue to stage sit in demonstration against the Bill during the day time at various villages and colonies while torch rallies were being taken out in the evening. People’s convention on Citizenship Bill 2016 in Imphal on Friday reaffirmed to launch a sustained movement until the unconditional withdrawal of the Bill. A decision was taken during the public convention held under the aegis of Manipur People Against Citizenship Amendment Bill (MANPAC), a common platform of 72 civil society organisations in Imphal. At this juncture six student bodies of the state have submitted a memorandum to Prime Minister demanding the withdrawal of the bill. The students’ bodies are All Manipur Students’ Union, Manipur Students’ Federation, Kangleipak Students’ Association, Democratic Students’ Alliance of Manipur, Students Union of Kangleipak and Apunba Ireipakki Meiheiroi Singpanglup. The citizenship (amendment) bill, which was passed in Lok Sabha on January 8, was introduced on July 19, 2016 and examined by the Joint Parliamentary Committee (JPC), according to the memorandum. Unfortunately the JPC did not visit Manipur and also did not try to hear the voice of the people of the State. In another development, a political parties’ delegation from Manipur submitted a memorandum to the union home minister Rajnath Singh urging him to incorporate a safeguarding clause for the protection of the indigenous people of Northeast region in general & state of Manipur in particular in the Citizenship (Amendment) Bill before its passage in Rajya Sabha, sources said. The decision to submit a memorandum to authorities concerned at centre through the political parties’ delegation which is currently camping in the National capital, was taken during an all political parties meeting in Imphal on January 28.